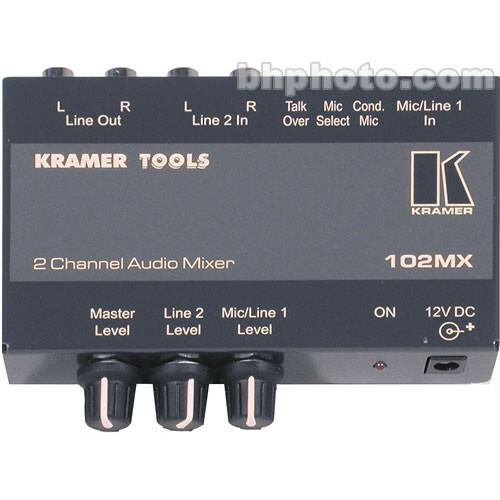 The Comprehensive / Kramer 102MX Compact Mixer features 2 channels with 1 mic/line switchable channel and 1 dedicated line level input. The mixer will accept dynamic or condenser microphones and features a Talk Over Switch for microphone announcements over background audio. There are three level controls for channel volume and mater output level. Channel 1 features a 1/4" phone connection, RCA connectors are featured on channel 2 and master output. The 102MX is powered with a 12VDC power supply (included). Box Dimensions (LxWxH) 9.2 x 4.9 x 3.5"